Adam works for an outreach organization. He comes to the Kotel in the afternoons and gathers Jewish tourists' email address and sends them to Torah centers in their city who then contact them trying to bring them in for classes or for Shabbos. 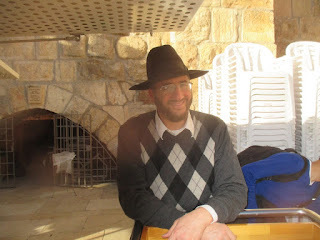 One Friday evening, many years ago, before Adam became religious, he was standing close to the Kotel. I was sitting some 20 feet away waiting for the prayers to begin. I saw him standing there without a headcover. I felt to go help him and tell him to cover his head, but I felt really tired. I sat there looking at him for a while and then after a minute or two I thought, "What would I want someone to do for me if I was standing there like he is?" I picked myself up and walked over; his eyes were closed, and his face was very close to the Kotel. "You know, you are the only one standing here without a yarmulke on your head. You really ought to go get one from the box over there." His mouth dropped open. He opened his eyes and slowly turned his head toward me looking amazed. He walked over to the entrance and took a yarmulke. Obviously, I didn't know it but right before I spoke to him he had just said to himself, "Hashem, if you are listening send me a sign." What actually happened? Hashem wanted to help Adam and he used me (thank G-d for the privilege) as His tool, but what is really interesting is the way He had me wait a few minutes and then walk over there just as Adam was ready to ask his question. If I would have gone over as soon as I saw him it would have accomplished nothing, so Hashem had me wait until the timing was right, then He poked me to get up and go over to Adam. And then when everything was ready, right as I was moving into place, He poked Adam into asking his great question. And that's how Adam got started 16 years ago.